The Rotary Club meeting for March 5th started off with multiple announcements concerning the upcoming Annual Baja Beach Bash. The gala party, set for Saturday, March 10 at 5:00 PM at the Windemere Hotel, is in the "estiramiento de casa" (home stretch). K.J. Wigton re-ported that door prizes were needed at the Windemere by 10 a.m. on Saturday; Karina Rice-Roberts reported on tickets still being available to give to prospective members; and Fred Shirley has been collecting recipes for the dessert gang to verify ingredients for food sensitivities (or because he’s creating a Sierra Vista Rotary Dessert Cookbook, go-ing on sale soon). :>) As the Baja Beach Bash is a fund raiser for our local Rotary clubs, the public is encouraged to attend and enjoy the music of Mark Mulligan and scare away any remaining winter dol-drums. Kief Manning, owner of Kief- Joshua Vineyards located in El-gin/Sonoita and in Willcox, spoke to the club about wine making in Arizona in general and about his vineyards and winery in particular. The club members learned that wine making in Ari-zona was legally prohibited from 1915 (soon after Arizona be-came a state) until 1980, some years after Arizonans in the 1970’s actually began researching wineries and planting vineyards in apparent ignorance of the law. Kief shared what a year as a vineyard owner, wine producer looked like: from March-April budding of the vines in Willcox, then Sonoita; to flowering in May; fruit setting in July and August; through harvesting anytime between the end of August through Halloween. Before, after, and in-between those events, Kief and his father spend their time chasing bugs, foiling mold and Texas root rot, and training grape branches and tendrils to the wires and away from the pathways between the grapes. When harvest time comes, no more than 24 hours after Kief’s personal grape taste testing says the grapes of a particular varietal are ready, Kief, his dad, and two friends harvest those grapes and immediately send the grapes through the crusher and de-stemmer. What happens after that depends on whether the grapes are those for a white wine or those for a red wine. Grape harvesting is not for amateurs nor for those sampling the wine as finger tips can be lost from sloppy handling and cutting of the grape bunches. Kief’s wines can be tasted at the Pizzeria Mimosa, Café Roka, and at the Beverage House close to Ace Hardware among other places. 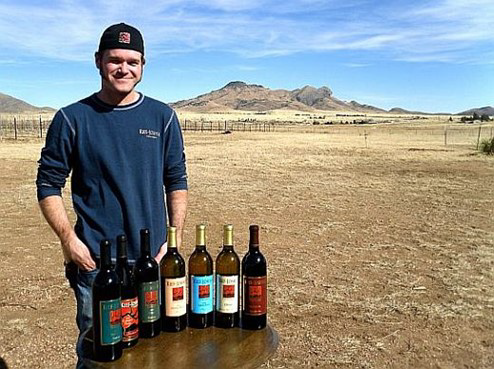 Kief added that his wines can be tasted at the Kief-Joshua Vineyards in Sonoita as part of the Sonoita Wine Festival. Jerry Regan mentioned that there would be a wine and food pairing with Kief’s wines at the Outside Inn, but if members did not already have reservations, they could "fuhgeddaboudit."